Cold weather is upon us, so it’s a good time to make some hot soup in the Vitamix. I decided to make a simple butternut squash soup, which is something that I’ve always meant to do. I’ve seen online raw recipes that I was curious about, but when it came down to it, the smell of the raw squash when I cut it open was not particularly appealing. I’ve always liked roasted vegetables, so I decided to go that route. I just roasted the squash and some other vegetables, and then blended them with coconut milk and some spices. It worked quite nicely. Preheat oven to 400°F. Cut the squash in half and scoop out the seeds. You can save them to roast/toast separately if you like. Poke a few holes in the yam. I coated the carrots and yam with a bit of olive oil. The onion I left whole, which was the one thing I regretted. It didn’t roast as much as I would have liked, so next time I will use something smaller, such as a few shallots, or cut the onion in half. Also, you want to use pretty fat carrots, or else you should put them in midway through the roasting. I put the garlic in halfway through because I didn’t want it to burn. Spread the vegetables out on an oven pan (I used foil to minimize cleanup). Add the cumin and coconut milk to the blender pitcher. I didn’t add too much cumin because I didn’t want to overpower the soup. I probably could have added more. Let the roasted vegetables cool for a bit (~10-15 min) so that you can scoop the squash out of its skin without burning yourself. Peel off the onion and garlic skins. I also peeled off most of the yam skin, which is probably not necessary, but I wanted to maximize smoothness. Blend it up, and prepare yourself for a tasty creamy soup. We found it pleasantly rich. When looking at other people’s take on butternut squash I came across this chef who’s rule of thumb is 1 lb butter per 1 pound squash! That’s about 50 times more fat per squash as I used; to each his own! Very good, I doubled the recipe! Excellent! If you have a good peeler then yes, I would remove the skin before cutting into cubes. 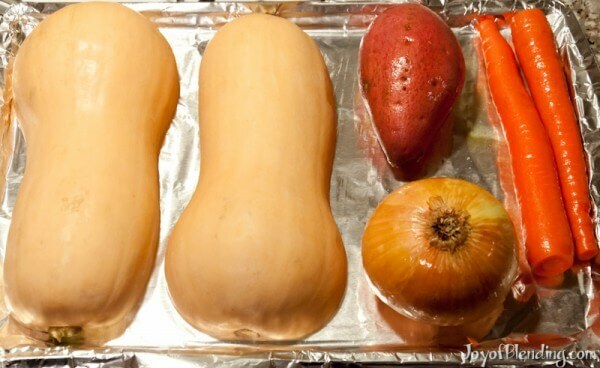 You can also easily remove the skin after steaming. It’s usually in the international aisle (often w/ Thai foods), sometimes in baking. I get it at Trader Joe’s, where it’s often in sort of a weird place, and sometimes I have to ask where it is. Great recipe ! i made minor modifications and skipped yam. It still tasted delicious ! thanks for sharing. I don’t see why not…. I’d start with an equivalent amount (14 oz) and see how it goes. Butternut squash, sweet potatoes, and carrots are all full of natural sugars. It’s supposed to be on the sweet side. If you didn’t like the coconut flavor and are not adverse to meat products, substitute chicken stock. The chicken stock is what is traditionally used in winter squash soup. Make this several times. Using regular coconut milk and was pretty thick, but delicious. I also used a combination of chicken broth with 1% milk to make the consistency I like as the squash and/or sweet potatoes vary in size. I also add 1/4 teaspoon of cinnamon and a dash of nutmeg. I do roast the butternut seeds (after washing) with olive oil mixed with a little cinnamon. Usually the seeds don’t last very long as they are SO good! Thanks for sharing your experience. I’ve never thought of putting cinnamon on the roast seeds, but it sounds like it could be tasty. 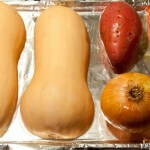 Does it matter if the squash is roasted facing up or down in the pan? I’ve always put the cut side facing down in the pan to keep it from drying out. This was very good but it had a slight bite to it that my husband did not like. 🙁 I can only think it had to be the garlic? Any opinions out there? Otherwise it was a good recipe! 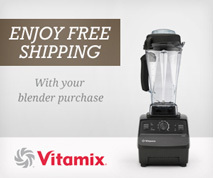 Just got a Vitamix. This was amazing. I substituted chicken broth and tripled the garlic (roasting really mellows it). Thanks for posting! Just made this! I forgot to roast carrots, so no carrots. I added approx. 1 cup of chicken broth to thin it, and 1 tsp of red curry paste. It was delicious! Thank you fo this recipe. Sweet potatoes (often called yams in the US) should read (often mistaken for yams in the US). Just made the soup today very good. And I can see it as a base for other recipes. I did use chicken stock to thin it out. 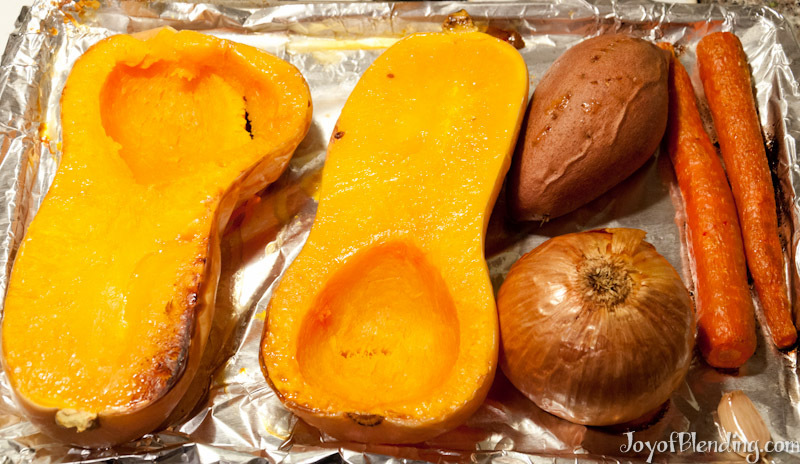 I started loving squash soups.This sounds good.Roasting the vegies makes a difference as it brings out the sweetness.In Canada we have the Yams–they are redish. and the sweet potato is yellow inside. lighter skin.